Apple also, today, updated the iMac and Mac mini computers. SAN JOSE, California—October 23, 2012—Apple® today unveiled a completely new iMac® with a stunning design, brilliant display with reduced reflection, and faster processors. * With third generation Intel quad-core processors, powerful NVIDIA graphics and an innovative new storage option called Fusion Drive, the new iMac is the most advanced desktop Apple has ever made. Redesigned from the inside out, the new iMac packs high-performance technology into an aluminum and glass enclosure with up to 40 percent less volume than its predecessor and an edge that measures just 5 mm thin. Built with an unprecedented level of fit and finish, the new iMac delivers an amazing desktop experience in a gorgeous design. The new iMac also features a completely reengineered display that reduces reflection by 75 percent while maintaining brilliant color and contrast. In the new design, the cover glass is fully laminated to the LCD and an anti-reflective coating is applied using a high-precision plasma deposition process. Every iMac display is individually color calibrated using an advanced spectroradiometer. Apple also updated the Mac® mini with third generation dual-core Intel Core i5 and quad-core Intel Core i7 processors that are up to twice as fast and have integrated graphics that are up to 65 percent faster. 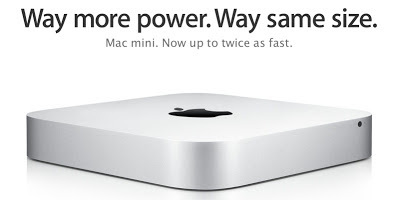 ** Mac mini comes standard with 4GB of 1600 MHz memory with support for up to 16GB. Retaining its amazingly compact aluminum design, the new Mac mini now includes four USB 3.0 ports in addition to its Thunderbolt, HDMI, SDXC, Gigabit Ethernet, and FireWire® 800 ports. The 21.5-inch iMac is available with a 2.7 GHz quad-core Intel Core i5 with Turbo Boost speeds up to 3.2 GHz and NVIDIA GeForce GT 640M for a suggested retail price of $1,299 (US); and with a 2.9 GHz quad-core Intel Core i5 with Turbo Boost speeds up to 3.6 GHz and NVIDIA GeForce GT 650M for a suggested retail price of $1,499 (US). The 21.5-inch iMac will be available in November through the Apple Online Store (www.apple.com), Apple’s retail stores and Apple Authorized Resellers. 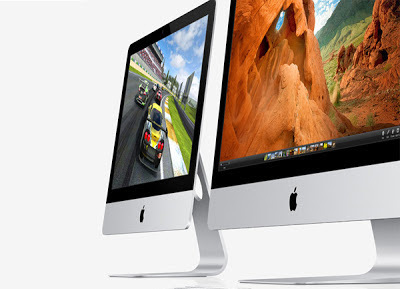 The 27-inch iMac is available with a 2.9 GHz quad-core Intel Core i5 with Turbo Boost speeds up to 3.6 GHz and NVIDIA GeForce GTX 660M for a suggested retail price of $1,799 (US); and with a 3.2 GHz quad-core Intel Core i5 with Turbo Boost speeds up to 3.6 GHz and NVIDIA GeForce GTX 675MX for a suggested retail price of $1,999 (US). The 27-inch iMac will be available in December through the Apple Online Store (www.apple.com), Apple’s retail stores and Apple Authorized Resellers. The Mac mini is available with a 2.5 GHz dual-core Intel Core i5 with Turbo Boost speeds up to 3.1 GHz, 4GB of memory and a 500GB hard drive for a suggested retail price of $599 (US); a 2.3 GHz quad-core Intel Core i7 with Turbo Boost speeds up to 3.3 GHz, 4GB of memory and a 1TB hard drive for a suggested retail price of $799 (US); and a 2.3 GHz quad-core Intel Core i7 with Turbo Boost speeds up to 3.3 GHz, OS X Server, 4GB of memory and two 1TB hard drives for a suggested retail price of $999 (US). 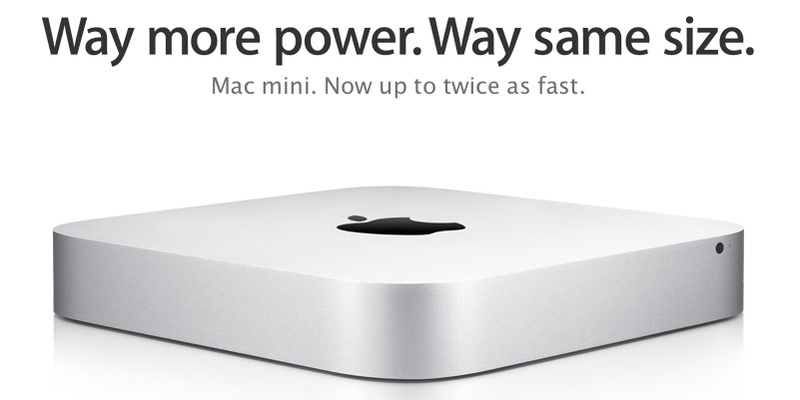 The Mac mini is available today through the Apple Online Store (www.apple.com), Apple’s retail stores and Apple Authorized Resellers. For more information about the new iMac and Mac mini family of computers, visit the Apple Mac website.